LILA’s Peer Support Club membership meeting is held on the third Thursday of every month at 1 pm. LILA has its annual membership meeting on the third Thursday in September where updates on our programs are given and light refreshments are served. LILA had a fundraiser on August 31, 2018 at 6 pm at the LILA Peer Support Club. The Eugene Slug Queens gave the benediction, the Radar Angels performed, and attendees could participate in karaoke. 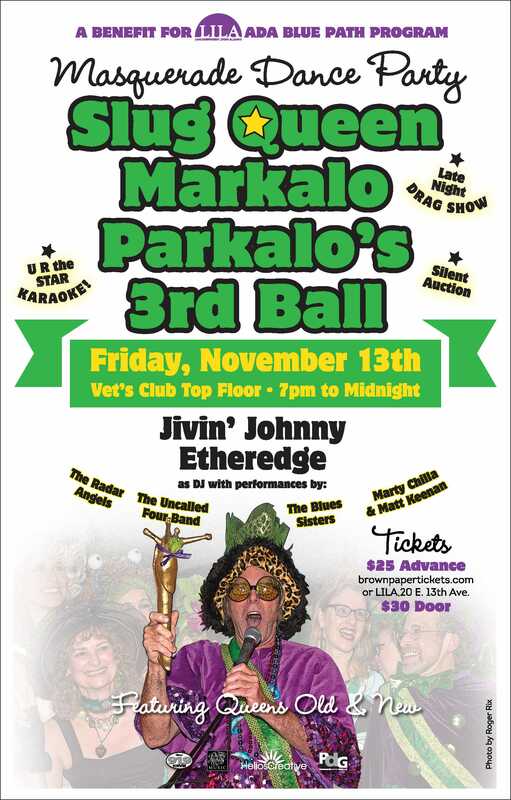 Slug Queen Markolo Parkalo’s 3rd Ball Masquerade Dance Party was held on Friday, November 13, 2015, from 7 pm to midnight. There was musical entertainment, a silent auction, and a midnight burlesque show. It also included dancing, free hors d’oeuvres, and a no-host bar. And, of course, there were Slug Queens old and new. The Sisters of Change has had an annual breast cancer awareness event for women over the age of 30 who live with disabilities, on a Tuesday in late October, at the LILA Peer Support Club. This was a free event with food, prizes, activities, and games to promote the importance of breast cancer prevention. LILA’s Oregon ADA Center held a celebration for the 25th anniversary of the signing of the ADA in July, 2015. We had live entertainment, performances by individuals with disabilities, a historical display, demonstrations of assistive technology, and refreshments. Two of our Northwest ADA Center-Oregon staff, Eugene Organ and Erycka Organ, with City of Eugene Adaptive Recreation Manager, Andy Fernandez, presented “Incorporating ADA Standards in Planning for a Recreational Event” at the National ADA Symposium, held May 12-15, 2013, in San Antonio, Texas, describing how they worked with the various U.S. Olympic Track and Field Trials 2012 planning committees on meeting accessibility standards. LILA had fundraisers at Cozmic Pizza. The Radar Angels often perform, followed by karaoke. We could have a fundraising flyer valid for the following week where purchases at Cozmic Pizza using the flyer go partially to support LILA. LILA also had a fundraiser on Tuesday, April 16, 2013 at Papa’s Pizza Parlor. By bringing the fundraiser flyer, part of the purchase price of food and gift certificates went to support LILA. The Oregon Disability Megaconference is held annually in October, usually at the Salem Conference Center. 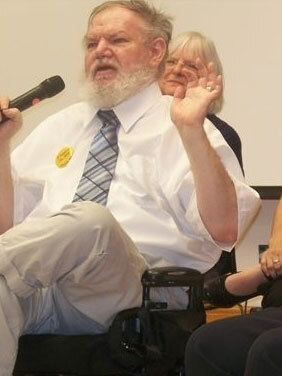 It focuses primarily on intellectual and developmental disabilities. LILA has helped with it in previous years. Visit their website for more information at www.oregonmegaconference.org or call toll free at 1-877-581-2726. On November 3, 2016, the Oregon Department of Transportation and Disability Rights Oregon announced that they are joining forces to make Oregon’s transportation system more accessible to people with disabilities.